In these lessons, we will learn how to use Carroll Diagrams. We also have some Carroll Diagram games that involve objects and numbers. Carroll diagrams are tables that work like Venn diagrams and are used for the purpose of cross-classification. For Carroll diagrams, two attributes are being used for sorting, with one attribute of each characteristic being the focus. The categories of a Carroll diagram should be mutually exclusive (do not overlap), for example even and not even numbers. In a Carroll Diagram, numbers or objects are either categorized as having an attribute or not having an attribute. A table is created with four cells to show the four possible combinations of these two attributes. Either the items themselves, or the count of how many items of each type, are put in the cells. Put the following numbers into the correct place on the Carroll diagram. Using a Carroll Diagram to sort numbers based on divisibility rules. Which of the following numbers are divisible by 4? by 9? by 4 and 9? by neither 4 nor 9? How to use Carroll Diagrams to Organize Numbers? 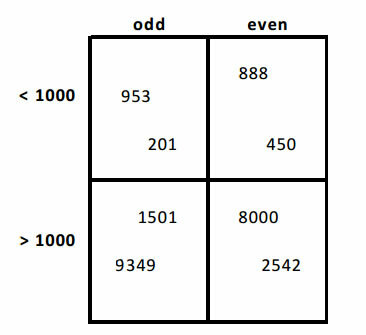 Organize the following numbers: Odd, Even, Multiple of 6, Not multiple of 6 using a Carroll diagram and a Venn diagram. Organize the following numbers: Divisible by 3, divisible by 5 using a Venn diagram and a Carroll diagram. Sort Numbers into a Carroll Diagram Can you put the numbers in the correct place in this Carroll diagram? Now have a look at this Carroll diagram. This time, the idea is to fill in the labels for the rows and columns. Carroll Diagrams Help your understanding of Carroll Diagrams and concepts like multiples, more or less and odd or even. One criteria and two criterias. A good teaching tool for interactive whiteboards.